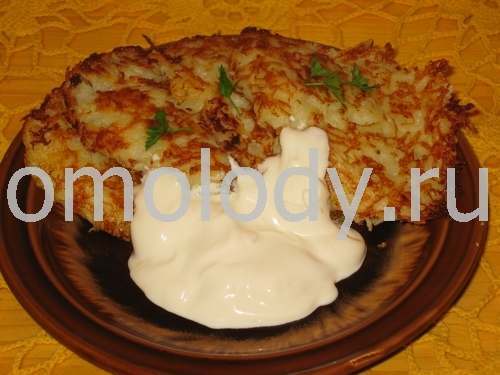 Potato oladie with filling. Recipes from Russia. 2 lb fresh peeled, finely grated potatoes. 8 oz mushrooms, fresh, washed and cooked, strained and drained. 8 oz fresh meat, ground. 1. Peel fresh potatoes and grate finely, squeeze out the juice and add boiled hot milk, instead the juice. Cool the mixture. 2. Combine with chopped onion, salt, pepper and eggs. 3. Make Filling: Chopped mushrooms combine with ground meat and greenery. 4. Take the 7 - 10 tablespoons of oil or butter and clarify them in large skillet over a low heat. Put 1 tbsp potatoes mixture into the skillet, and add in the centre it 1 tsp filling. Place over a medium- high heat and when hot fry the Oladie for approx. 5 - 7 minutes per side or until done to suit your taste. 5. Serve with grated cheese or sour cream.